2013 was a remarkable year for healthcare conferences. 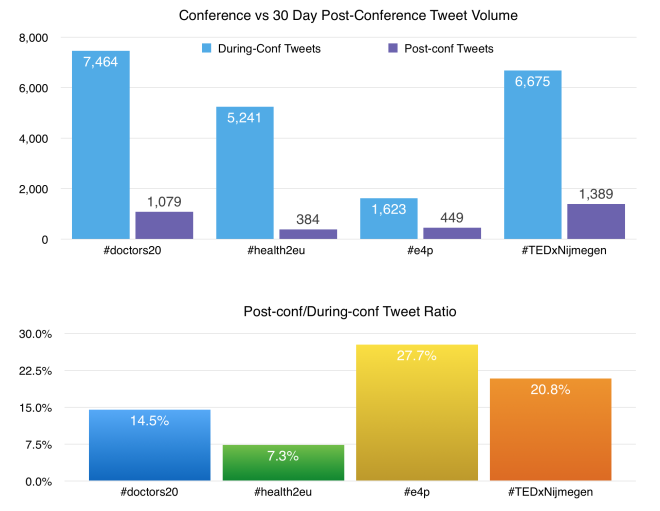 We like to call 2013 the year healthcare conferences became social. More than 1,080 healthcare conferences were registered and tracked with us last year. That’s more than twice the number from 2012. In other words, it was no longer just the cutting edge health tech conferences that engaged socially – a large number of clinical and other mainstream healthcare conferences joined in. With all the data that we continually collect from these conferences, we’re having lots of fun looking at what’s taking place and especially at what some of the best performers are doing. In a previous blog, we looked at some of the leading U.S. based conferences. We’ve since received much feedback and many requests wanting us to look at some similar healthcare conferences based in Europe. Most conferences’ social activity flatlines immediately after the event is over (see example flatline graph). Apparently both the organizers and the attendees quickly “give up” on the social community that was built up during the conference. We believe this is a huge lost opportunity for all stakeholders involved including the organizers, sponsors and the attendees. In the graph above we have plotted the tweet volume during the 30-day post-conference period. Compared to the typical flatlining, these four conferences have done a great job keeping the conversations alive. What were the results of keeping the conference community socially active? Taking the #doctors20 conference as an example, their 1,079 post-conference tweets managed to create almost 5 million potential impressions in people’s Twitter feed. They had 371 people participate in the conversation of which 80 people were “highly engaged”. #TEDxNijmegen’s 1-day conference created a remarkably strong conversation immediately after the conference with 1,389 tweets and 683 participants. 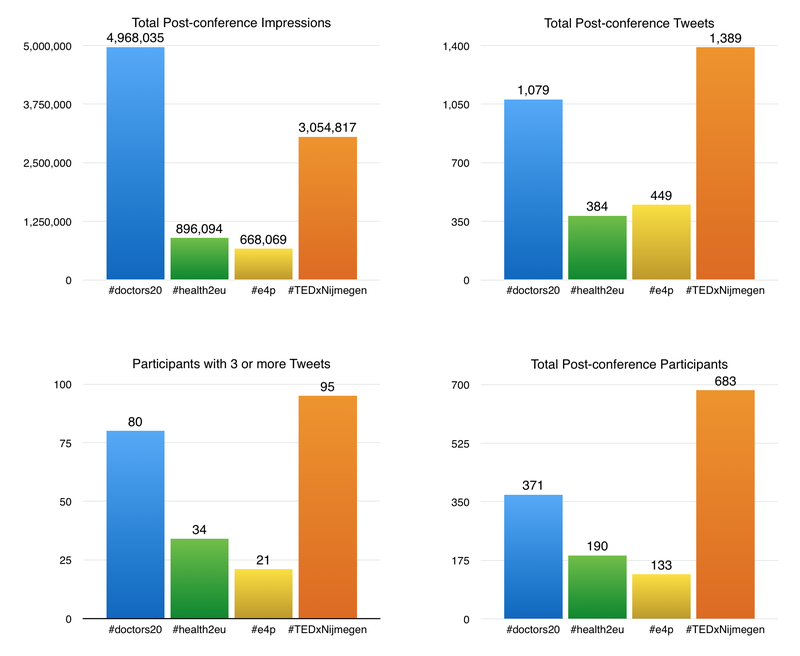 An interesting metric to look at is the ratio of post-conf tweets to during-conf tweets. It gives you a sense of how big the post-conference activity is relative to the tweet volume during the conference. 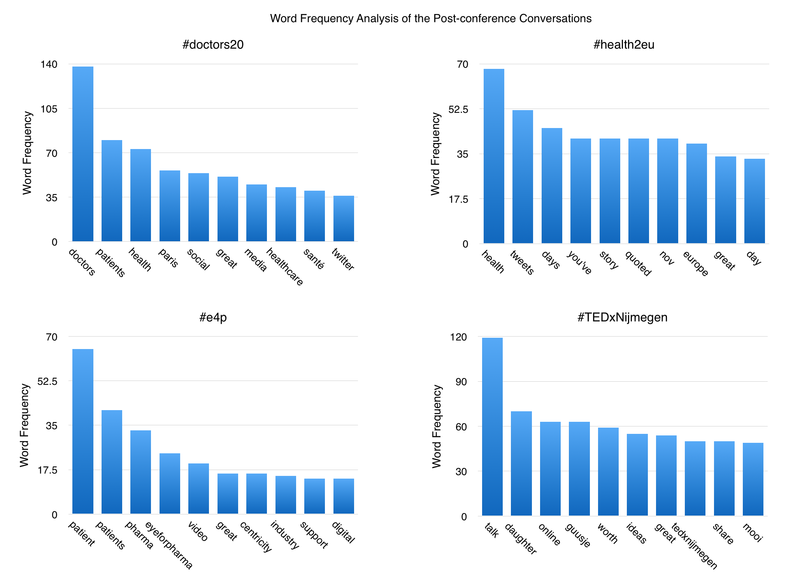 From analyzing the content of these conversations, we find the top 10 most frequently used words for each conference. They’re a rough estimate of the top conversation topics. Is it possible to see some patterns of the better performing conferences? We assume that post-conference conversations are largely influenced by the topics of the during-conference conversations. We would like to again put the focus on how central the patients are in these conferences. 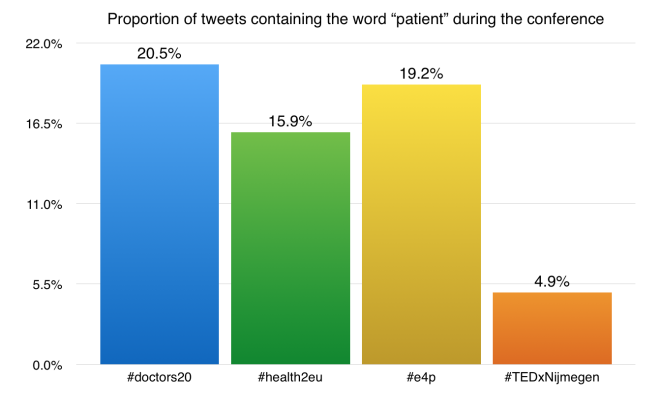 The graph above shows the proportion of tweets that contain the word “patient” during each conference. We can not make any conclusions from only looking at four conferences, but it’s noteworthy to see that for a conference like #doctors20 we do find a correlation between strong patient focus and high engagement scores. This was also echoed in our findings for U.S. based conferences. What’s fueling the post-conference conversations? From the anecdotal evidence in these two blogs, we see a relationship between “Patient Included” conferences and their lasting impact as measured socially. In the graph above we have analyzed the combined social impact of the 42 articles and blog posts written after the #doctors20 conference. The articles are conveniently listed here, and through our analytical tools we queried each social network’s API for the total shares of each article and then combined the numbers. It seems to us that those conferences that are willing to include patients, not only as attendees and speakers, but also as conference designers, benefit from creating a stronger impact through the stories told. Nothing is shared more on the social web than stories, and no one has better or more important stories to tell than patients. Note: Word frequency analysis does not consolidate the numbers for words of same meaning across languages.